Judy Woodward Bates is a speaker, TV personality, columnist for Examiner and Travelin' Tales, and author of Bargainomics: Money Management by the Book. With her permission, I am sharing this article she wrote, which was previously published in Baptist Press. 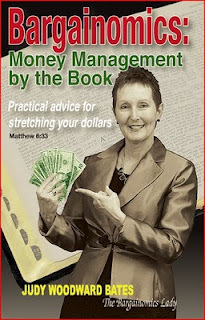 Schedule her to speak or order her latest book at: Bargainomics. If I asked the question, "How do you earn your living?" I'd get a lot of different responses. Truth is, there's one simple answer: by exchanging your time for money. Whether you dig ditches or perform heart surgery, your time is given in order to receive payment for services. How you manage those paychecks and the lifestyle you choose to live determines how much of your time you need to exchange for money. And while working is a healthy part of living, no person should focus so much on acquiring money -- or the stuff you then exchange the money for -- that he neglects time with those he loves. Particularly if the Person you neglect is Jesus. He reminds us in Jeremiah 31:3: "I have loved you with an everlasting love; I have drawn you with lovingkindness." God never quits on us, so why would we quit on Him? Some years ago I was talking to a successful car salesman who told me, "I work Monday through Saturday, so Sunday is my downtime when I can stay home and relax. Business is just too good to slow down right now." Today this guy is singing a different song. Business is slow, but he's now required to work even more hours to maintain his current lifestyle -- and even with the extra work, he's really struggling. Can't a person work like crazy and still spend time with the Lord? Read Hebrews 10:25: "And let us not neglect our meeting together, as some people do, but encourage one another, especially now that the day of His return is drawing near." Believers need not only individual times of prayer and worship, but corporate prayer, worship and fellowship. And let's consider once again the whole time thing. What does the Bible say about that? In Luke 12 and "the parable of the Rich Fool," Jesus tells about a man who has stacked up so much wealth that he's decided to tear down his old barns and build bigger ones to hold it all. In preparation for a time he'd envisioned when he could kick back, relax and take it easy, this man had spent his entire life focused on nothing but adding to his coffers. What did Jesus say about this man? "You fool! This very night your life will be demanded from you" Luke 12:20a. Not one person on this planet knows how long or short his life will be. Yes, doctors can make educated guesses when it comes to certain illnesses, but still they're only guessing. Only the Lord knows how much time we have and, as believers in Jesus Christ, our time should be spent focused on Him and on those He has placed in our lives -- our family, our friends, our church and those He would have us reach for His Kingdom.